I love trains. If you’ve been a fan of HeidiTown for any length of time you are already aware of my train obsession. I’m not into the technical stuff, but I like the experience of train travel and the nostalgia that comes with it. Train travel forces us to slow down and look around; something we should be doing on a daily basis. 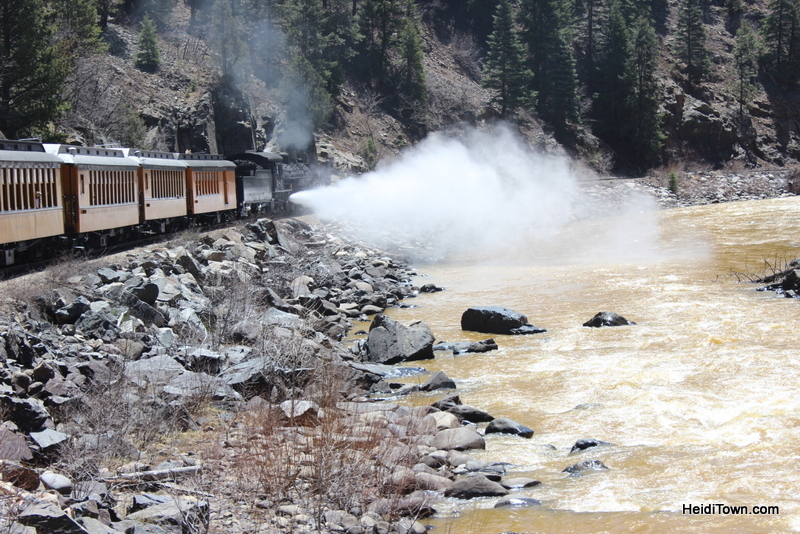 While in Durango last month, Ryan and I had an opportunity to ride the famous Durango & Silverton Narrow Gauge Railroad. We boarded on a brisk morning at the end of April. I was gripping my camera and probably sporting a rather silly grin, because I’d been looking forward to this ride for a very long time. We were happy to discover that a tour group of Brits were in our car. We love the British, and they did not disappoint – proving to be a very entertaining lot. I suppose this is where I should tell you a little bit of the history. Durango was developed as a railroad town by the Denver & Rio Grande Railroad in 1880. The railroad arrived in town the next year, and construction on the line to Silverton began that fall. By July of 1882 the tracks to Silverton were completed and the train began hauling both passengers and freight. If that seems fast, it was. After WWII, the Silverton line was nearly shut down, but thanks in part to a slew of 1950s westerns filmed in the area that featured the train, tourist began flocking to Durango. Today, the train provides year-round service. The locomotives used to pull the train are 100% coal-fired, steam-operated, and circa 1920s. As soon as the train left the station we moved to one of the open-gondola cars, as did most of the Brits. The open-gondola cars are excellent during warmer months, although you will be covered in a thin layer of coal soot by the end of the day, and by the end of our excursion I’d made the decisive decision never to work in a coal mine. 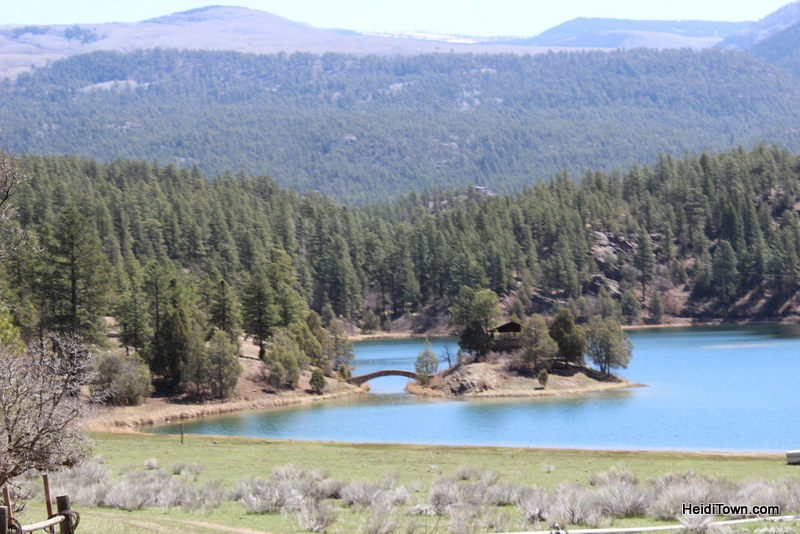 The first part of the ride winds along the lazy Animas River. The flat lands provide vistas of cows and the occasional hawk gliding high above the fields, and, much to the delight of our British friends, prairie dogs. Hundreds of prairie dogs popped their heads up to watch the train go chugging by, and each sighting elicited a little squeal of delight from the train’s British passengers. “They are much smaller than I expected,” said one British lady, trying to snap a picture with her point and shoot. I sat by this woman during much of the ride, so I felt compelled to tell her that most Coloradans, especially ranchers, aren’t big fans of prairie dogs except the people who live in Boulder, and I left it at that. As the train began to climb into the San Juan National Forest I inhaled the smell of camping and coal soot. We were in a car near the back of the train, so everyone was trying to get a photograph of the engine, without a number of elbows in the photograph. The Brits, being fairly polite folks, seemed very aware when their elbows were intruding on someone’s view, but it was still a rather funny game and everyone seemed to be playing. We continued to climb, occasionally getting glimpses of the blue water of a lake or the muddy brown water of the swirling Animas, deep in the canyon. The river gets a lot more jovial along this part of the route as it cuts through the rocks making its way towards Durango. Our route was only taking us as far as Cascade Station, 25 miles one-way. On the first weekend in May the entire route would open for summer, extending 45.4 miles each way from Durango to Silverton. Passengers are given several hours to explore Silverton before returning to Durango, or they can spend the night and catch the train the next day, or they can get a bus back. There are lots of options. There’s even the option of getting off the train to zip line at Soaring Treetop Adventures, but I’m going to save that write-up for another day. The whistle blew as we pulled into Cascade Station, where we would disembark for lunch and a quick hike down to the river. If you are only going as far as Cascade Station, pack a lunch. While I have no other complaints about the railroad or this experience, the food available for purchase on the train left much to be desired. The highlights on the return trip were more stunning landscapes, two puppies I spotted in a front yard, a herd of elk lounging at a golf course, some beautiful migrating ducks, and a train chaser dressed in Native American garb carrying a “Welcome to Durango” sign. 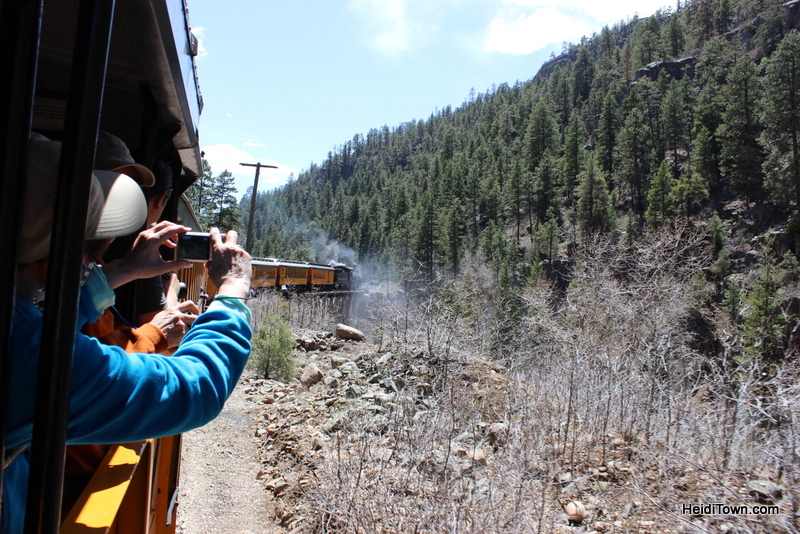 According to one of the train’s staff members, this lady seems to have dedicated her life to waving at the Durango & Silverton Narrow Gauge Railroad – every day, weather permitting. 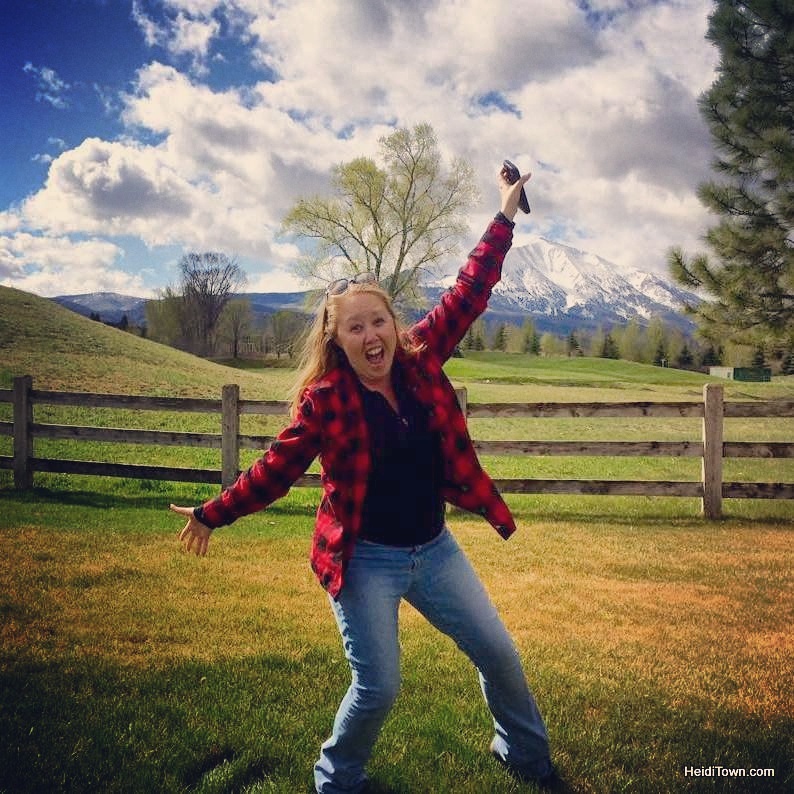 We first spotted her a number of miles outside of Durango; as the train came around a curve, she was at the railroad crossing dancing and waving her sign. Well that’s cute, we thought. Then Ryan spotted her inside a car racing alongside the tracks. A few miles later she had outrun the train and was again, outside of her car waving gaily at us. We saw her so many times that some of the novelty wore off, but not all of it. And of course, she was there in Durango as the train pulled into the station. We weren’t sure whether we felt welcomed or stalked, but it was certainly entertaining. 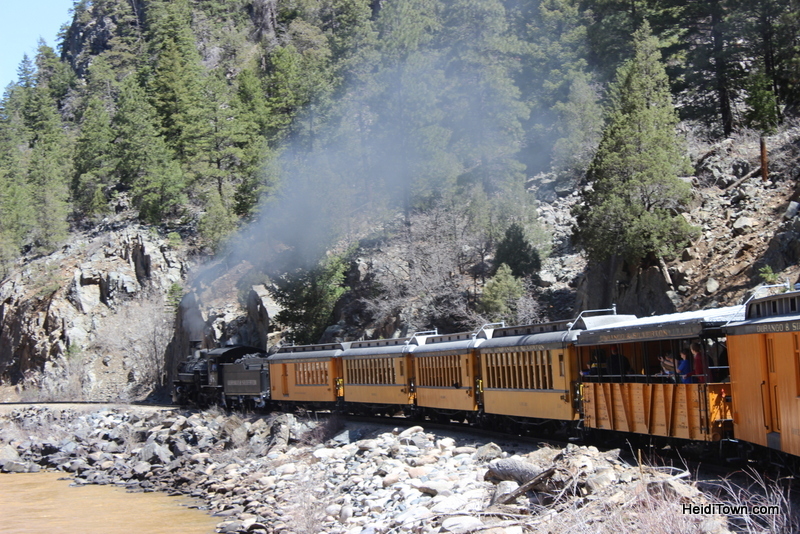 My tip for the Durango & Silverton Narrow Gauge Railroad is to pack a lunch and go. I loved every moment of our ride, from discussing prairie dogs to making myself dizzy by starring directly down into the splashing river from one of the railroad bridges over the canyon. The layer of soot across my forehead at the end of the day was well worth it. Book your trip on the Durango & Silverton Narrow Gauge Railroad at DurangoTrain.com, and learn more about Durango and the surrounding area at Durango.org. This trip was sponsored in part by Durango.org. Ahhhh! That looks awesome! I love trains and would love to do something like that. How cool and a great way to see the scenery. Thanks for stopping by, Andrea! Definitely a great way to see the scenery. I can’t imagine how beautiful it must be when the flowers and trees are in full bloom! We were a little early in the season, but the sky was blue, so I was happy! The Soaring excursion is fantastic! Highly recommended. We are definitely planning to do Soaring Treetops! Looks amazing on their website. Can’t see much from the train, but I’ve heard so many good things! Thanks for stopping by, Stina! I would love to visit Durango in the SUMMER, to take that fabulous train ride. My last visit to Durango was in Mercy Hospital overnight from crashing my car into a snow plow. What fantastic people, also the ambulance crew in Pagosa Springs. Wonderful story!! 🙂 Eager to give trains a go. Excellent. Makes me want to head out for that wonderful trip. I would love to meet you. We are friends of your grandparents and your Mom. 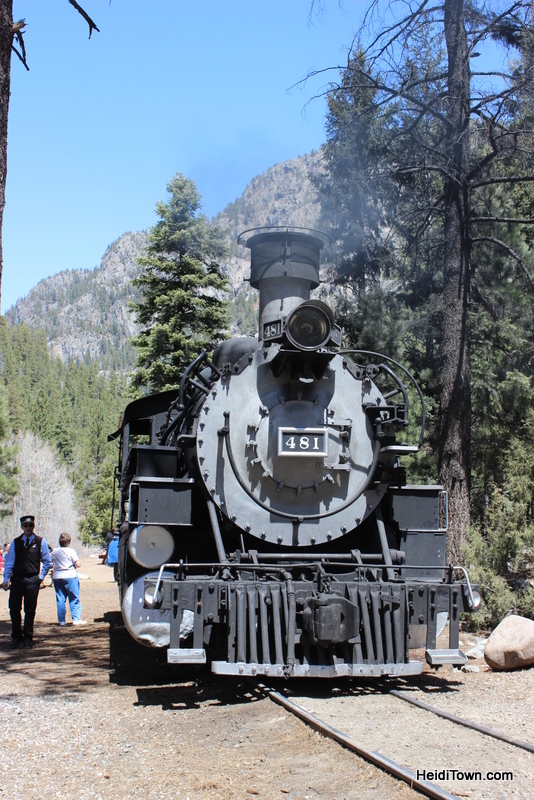 Thank you for the brief history of the Durango train! My wife and I have been thinking about taking a train ride to Colorado, but we weren’t sure what to expect with this old type of transportation. Again, thank you for the train information. Happy to help, Jack! Thanks for stopping by HeidiTown.